So, you bought a new laptop and you are not very familiar with Touchpad because it is different than the usual Mouse on the computer. Moreover it has different sensitivity and speed, than the normal mouse and you don’t have much experience. At first it’ll be hard to get adjusted and sometimes you may even want to tweak the sensitivity when you connect mouse. In this article we will talk about softwares that supports configuring the sensitivity of Touchpad and Mouse. AutoSensitivity : Mouse sensitivity too high, Touchpad too low, what to do? Use AutoSenstivity. It is a small application and installation is via online (like Google Chrome, where the download will proceed only after you agree to the Terms/EULA). After installation, you will find a sys-tray icon of AutoSensitivity which has some options as: Open, Refresh, Update and Donate.AutoSensitivity lets you change the performance of your touchpad independent of the behavior of a mouse. The program can also automatically switch between settings based on mouse connect/disconnect. AutoSensitivity works with Windows XP/Vista/7 and it needs Microsoft .Net Framework 3.5/4.0. 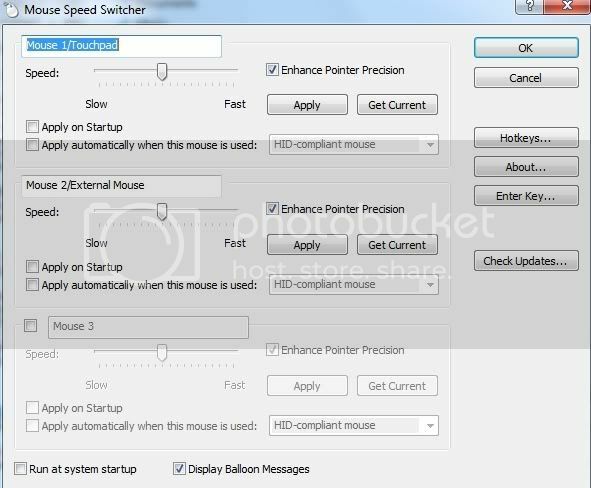 Mouse Speed Switcher : It lets you set your mouse to be more or less–responsive than your touchpad, and vice versa. Installation is easy and can auto-start with Windows. It has 3 sets of mouse settings which can be switched between quickly and easily. Configuration of each mouse settings is handled in the main application window. The mouse speed can be configured with a slider individually for each mouse setting. There is also an additional option, to enhance pointer precision, this option should be selected for smoother movement of the cursor. Several other options are there to switch settings, you can switch to different speed settings from the system tray icon, via keyboard hotkeys or let the program do it automatically when the mouse (or the touchpad) is used. Mouse speed switcher can be used freely without registering it, but after some days a reminder message will be displayed, also the auto setting feature will be disabled. Automatic Mouse Switcher: As the name suggests, it will automatically apply different settings for all your input devices like mouse or trackpad/touchpad to enhance the experience. From a single interface, you can manage all the settings (speed, scrolling, sensitivity, etc) for each device in a few clicks. 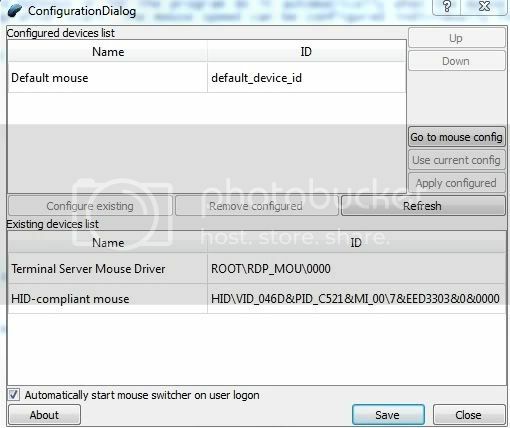 If you have more than one mouse, then this software will let you to automatically apply the right settings after initial configuration. Select the one you would like to configure and set the parameters easily. You can also set the priority from Up to Down (when background switcher detects new device, it will look through list of devices from top to bottom and will select the first configured device present). From the main interface you can see all detected mouse/touchpad devices and it refreshes automatically upon detection of a new mouse or removal. Background switcher amswitcher.exe – background process that switches mouse settings whenever it detects hardware changes. It will pop up notification balloon in tray each time it happens. There is no tray icon shown, except for when balloon pops up. Configuration utility ams_config.exe – GUI configuration application that allows you to adjust list of configured devices and appropriate mouse settings. Once you change the settings, they will be propagated to background switcher usually within 1 minute. You should only run this application when you need to change settings. You can ensure background process is started by checking Windows Task Manager – process names amswitcher.exe should be launched with current user credentials. Even without the above applications you can change the mouse pointer speed using Windows Control Panel. But, this setting takes effect on all mouse devices connected without specification. To, apply different settings to different mouse devices then you need to use other softwares. We hope that the above mentioned programs will help you in case you need to work in better environment and switch from Touchpad to different Mouse devices easily.